This model, LTD16TC, 16CH HD-TVI AHD H.264 True-HD DVR (Digital Video Recorder) is designed especially for CCTV system. It adopts high performance video processing chips and embedded Linux system. Meanwhile, it utilizes many most advanced technologies, such as standard H.264 with low bit rate, Dual stream, SATA interface, HDMI and VGA output mouse supported, IE browser supported with full remote control, mobile view (by phones), etc., which ensure its powerful functions and high stability. Due to these distinctive characteristics, it is widely used in banks, telecommunication, transportation, factories, warehouse, and irrigation and so on. DVR can connect 16 HD/SD cameras by using wired cable with BNC connectors and 2 IP Network cameras by using IP address. 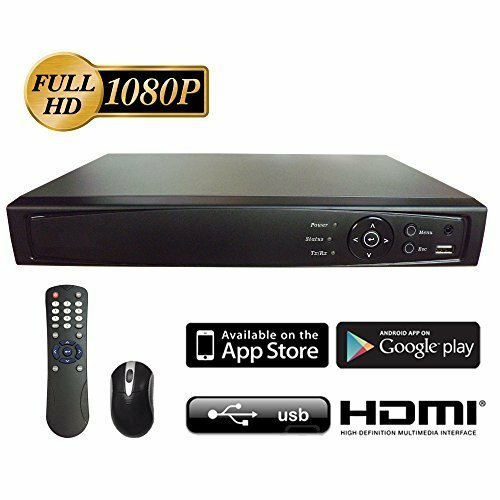 16CH HD-TVI AHD H.264 DVR with 1TB HDD and Accessories(Power supply, Mouse, Remote). VIEW ANYWHERE, ANYTIME through Snapshot, SMS text, & Email notification to cell phones. With EXCEPTIONALLY　SECURITY and PRIVACY via Video Encryption, strong password, and Anti Hacking protocols. Full HD picture quality, CLARITY up to 1080P (1920x1080) resolution @12 FPS and 960P (1280x960) or less at 30 FPS for solid day & night surveillance applications. MOTION ACTIVATED full screen alarm call up notification & optional audible warning. Working with EXISTING ANALOG SD & NEW HD surveillance system compatibility with MULTI-video formats including Full HD/TVI/AHD, SD/960H/CVBS video, and ONVIF compatible IP/network cameras. User Friendly CLOUD based APPs without confusing Port Forwarding for both Android and iPhone, EXTRA VIEWING STATIONS via multiple video out connectors including: HDMI/VGA/BNC/IP networ. US LOCAL TECH-Support and CLEAR SETUP INSTRUCTION including QIG(Quick Installation Guide) for PC based VMS/CMS integration, CLOUD based cell phone APPs, and real time Snapshot alarm notification. Business hour: Mon - Fri, 8:00 am - 5:00 pm, pacific time. If you have any questions about this product by 101 AV Inc, contact us by completing and submitting the form below. If you are looking for a specif part number, please include it with your message.